The top three finalists of the 2019 Synapse Life Science, including grand-prize winners Sergio Aguirre (second from right) and Mike Willand (third from right) of Epineuron Technologies. Photo from Innovation Factory. It was 2014 and Willand was doing a postdoctoral fellowship at SickKids hospital in Toronto. He’d completed his PhD in biomedical engineering at Mac two years prior, working on using electrical stimulation to treat muscles following nerve damage. When Augusta came into the operating room with 95 per cent of her leg severed, Willand was on-hand to help set up the Grass SD9 Stimulator, a device that looks a little like a car battery from the 1960s. The plan: based on research pioneered by neuroscientist Tessa Gordon and others at the University of Alberta, the surgical team was going to give Augusta’s injured leg an hour’s worth of electrical stimulation to encourage the damaged nerve fibres to regenerate quicker, improving sensation and mobility as Augusta recovered. The problem was that the Grass SD9 was difficult to use, especially for surgeons and nurses already preoccupied with the intricacies of the surgery. It’s not that the technology didn’t work. According to clinical trials completed since 2014 by Ming Chan in Edmonton, patients undergoing surgery for peripheral nerve injuries – treating carpal tunnel syndrome, for example, or reconnecting a severed nerve in a finger – who received an hour of electrical stimulation to the damaged nerve at the point of surgery gained at least a 40 per cent increase in sensation, a 50 per cent increase in motor connections and 30 per cent faster recovery than patients who didn’t receive the stimulation. But the existing technology was big, and clunky, and only approved for use in research settings, not for widespread commercial use. “It was easy for me to see that this particular implementation won’t work outside the research setting. It was lacking in multiple ways, from the electrodes, to the box, to the workflow during surgery,” Willand remembers. Willand knew there had to be a better way – so he connected with Sergio Aguirre, who had been his roommate while both did their master’s in biomedical engineering at Mac. The two weren’t new to working together – as grad students, both were part of a week-long intensive pilot project designed for would-be entrepreneurs in STEM fields, and both had worked with the McMaster Industry Liaison Office, filing patents and getting familiar with the world of intellectual property. Aguirre had also already been a part of another Mac-based start-up, working with a professor on a DNA-based bio-sensors. 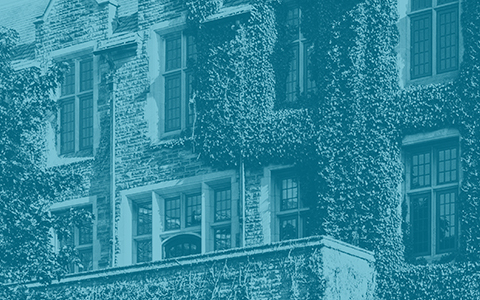 Interested in the business side of research and commercialization, Aguirre went from McMaster to Western to complete an MBA, and worked in a number of positions that combined his biomedical engineering background with his business know-how. When Willand finished his postdoc in 2017, he and Aguirre officially teamed up, and their company, Epineuron Technologies was born. It was a deliberately slow birth. While the two had originally envisioned creating a device that could be used during surgery, a years’ worth of interviews with surgeons across Canada and the U.S. let them know that adding an hour to most surgeries would be unfeasible, both because of high operating room costs and because many nerve-related operations simply don’t take that long. The solution? Use the time that patients are in recovery following surgery – usually about an hour – to deliver nerve stimulation. Willand and Aguirre developed a single-use, disposable “nerve bandage” consisting of a thin wire with an electrical lead at one end, attached to a wearable electronic patch that sits outside the body. The wire can be implanted in less than a minute right before a surgical incision is sewn up, left to work while the patient is recovery, then extracted easily once the hour is finished. The company is on track to produce its first clinical units by the end of this year, with full commercialization planned for 2021. Willand and Aguirre have gotten some important validation that they’re on the right track. A year ago, they successfully applied to the FDA for their technology to be deemed a “breakthrough medical device,” a designation that indicates the device is filling an unmet clinical need. Epineuron is one of the first companies in Canada to have received that designation – one that could make eventual FDA approval of the device much faster. 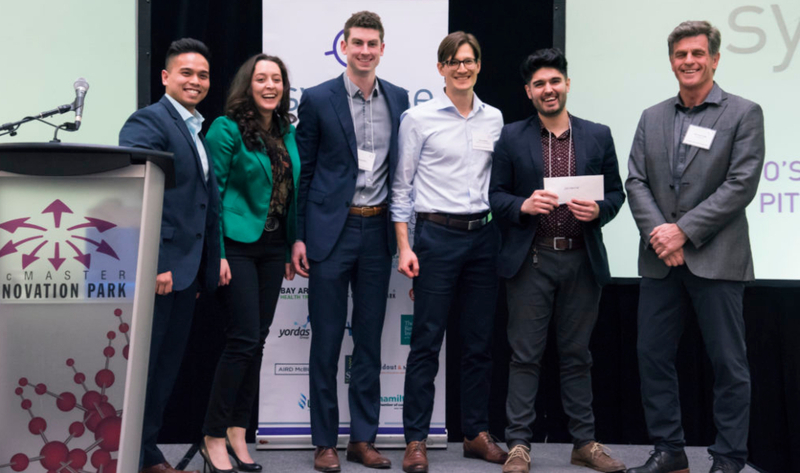 Most recently, they won the Synapse Life Science Competition, a Hamilton-based pitch competition aimed at encouraging the city’s burgeoning life science sector. Along with a $25,000 cash prize and a $5,000 in-kind consulting package from Shift Health, Epineuron also gained a public forum to raise awareness about the potentially life-changing consequences of peripheral nerve damage, Aguirre points out. “This kind of nerve damage isn’t life-threatening, but it can change your whole life,” says Aguirre. “One woman we spoke to said she couldn’t hold her baby,” adds Willand. “The standard response has always been that there’s nothing that can be done about peripheral nerve damage, so patients would just have to learn to deal with the effects. That’s exactly why getting exposure to the problem is so important.